For someone very near and dear to my heart! Supplies: Stamps – Cornish Heritage Farms, Hero Arts, Papertrey Ink, Simon Says Stamp, paper – Neenah Classic Crest Solar White, Stampin’ Up! Basic Black, Green Galore (retired), Lovely Lilac (retired), Orchid Opulence (retired), Tempting Turquoise, inks – Copic B05, YG06, V04, Stampin’ Up! Green Galore (retired), VersaFine Onyx Black, Smokey Gray, dies – Hero Arts (cups, lids), Lawn Fawn (stitched rectangle), Provo Craft (numbers), embossing folder – Provo Craft, sequins – Pretty Pink Posh, embossing powders – Filigree Fine Art Powder clear, Ranger Silver Pearl. Categories: birthday, card | Tags: card, Copics, Cornish Heritage Farms, Hero Arts, Lawn Fawn, Neenah, Papertrey Ink, Pretty Pink Posh, Provo Craft, Ranger, Simon Says Stamp, Stampin' Up!, Tsukineko, VersaFine | Permalink. Wouldn’t it be nice if coffee shops had such decorative and individual cups? Great, fun card. I had to wait to read this on my pc today. For some reason I couldn’t scroll down or across on the tablet I was using yesterday! Nice story. I like it when art makes people think a bit. Thank you, Mrs. Craft! I stamped all of the coffee cups with stamps that meant something to the recipient. 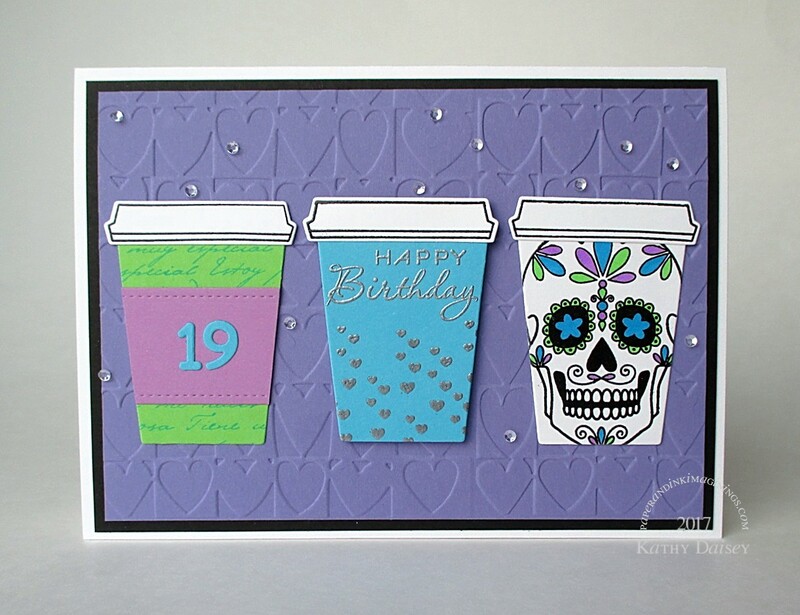 Lovely, bright and fun card. Thank you, Cobs! So nice to “see” you – thank you for stopping by!